Looking for the best way to get from Dublin Airport to Dublin City Centre? We’ve reviewed your options with taxis, buses and tickets. Before we start, there are some basic facts you should know about Dublin Airport. 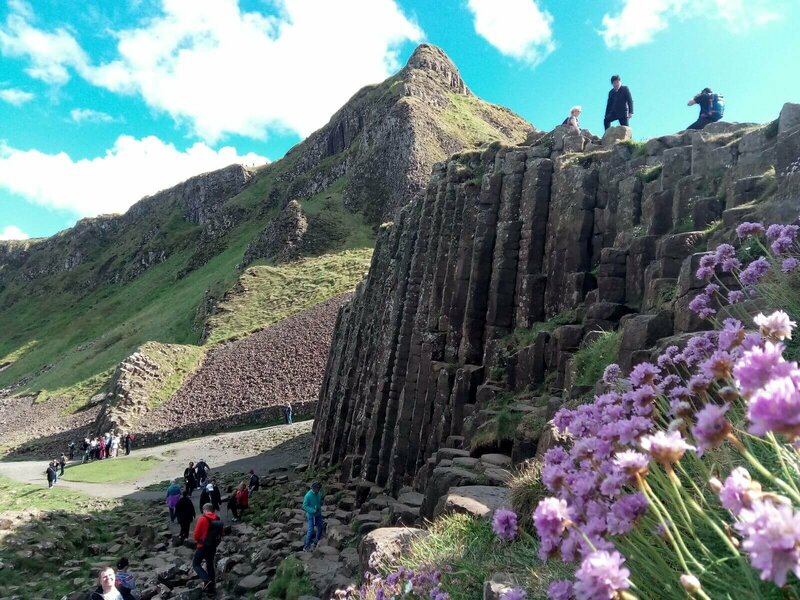 It’s only 10km from the airport to Dublin city centre. This means a 2o-30 minute journey by car or bus without traffic congestion. Dublin Airport has 2 terminals; they are known (imaginatively) as T1 and T2. Most direct flights from North America land in T2 (Aer Lingus, Delta, United, US Airways, American Airlines). Transat and Air Canada (as well as other airlines) flights land at T1. Check your airline to see where you are landing. There is no transport between terminals. However, T1 and T2 are relatively close to each other (1km – 12 minutes). An external walkway allows you to walk between T1 and T2, if needed. There are no train services from Dublin Airport to Dublin city centre. We recommend this option. Catching a taxi to and from Dublin Airport has several advantages over public transport. You are dropped from outside Dublin Airport directly to the door of your hotel in Dublin City Centre. Dublin taxis move fast through traffic. They can take advantage of the city’s dedicated bus lanes to cut journey times. Both Dublin taxis and bus services operate 24 hours a day. But the wait for a taxi will most likely be shorter. Not travelling alone? Take a taxi. The standard taxi fare (between €20-€30) makes sense if you are in a group. With more than two people, you will most likely save money over the equivalent bus tickets. 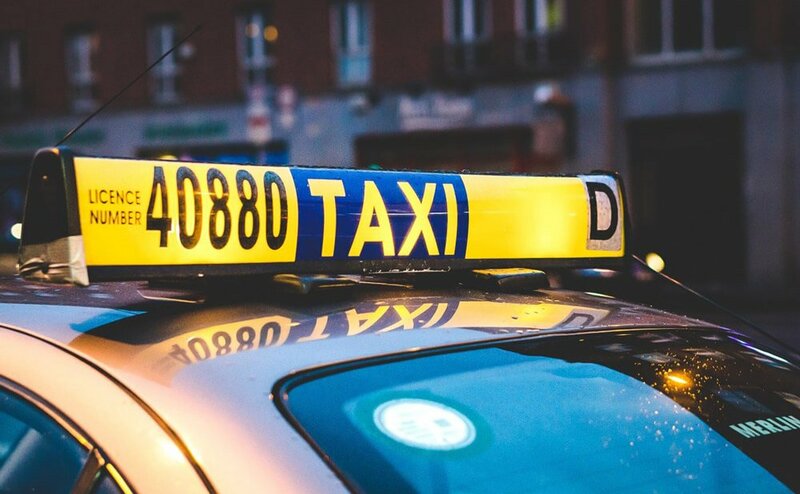 The standard taxi fare from Dublin airport to Dublin city centre can rise if you are travelling on an Irish public holiday or late at night. Or if your hotel is not in the city centre. 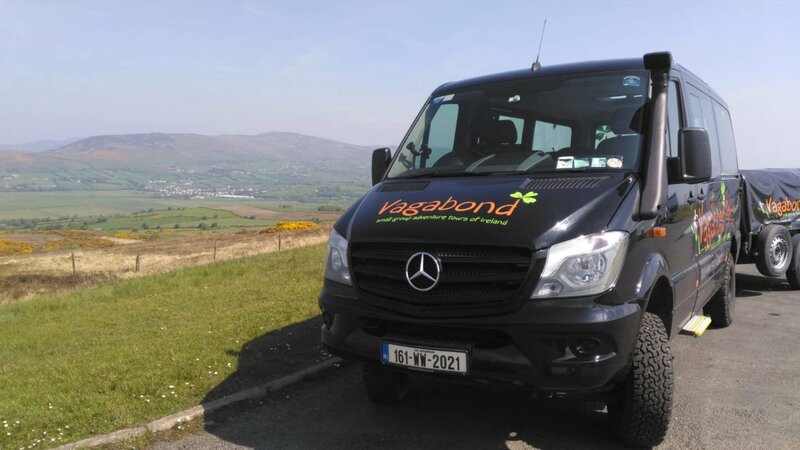 For example, a taxi from Dublin Airport to the Grand Canal Hotel (Vagabond Tours pickup point) would cost between: €24.40 to €35.40. Make sure your taxi driver is using the meter, mounted on the dashboard. Never agree a fixed price unless you know it’s fair. 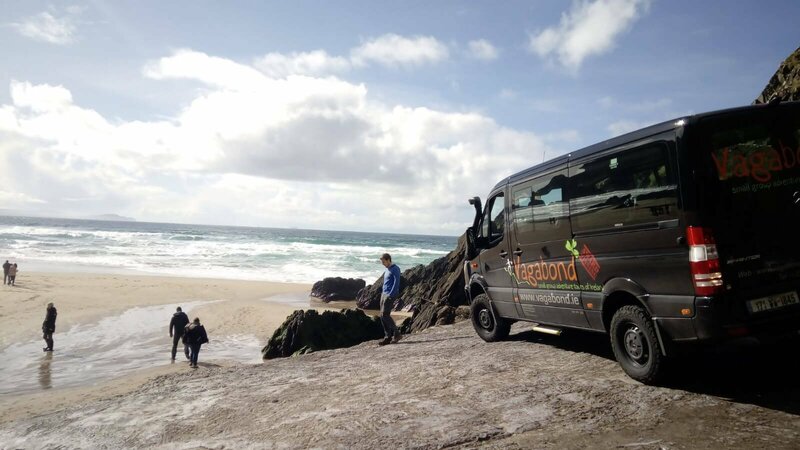 If you’re travelling as a group with lots of bags to a specific location, taking a taxi from Dublin Airport to Dublin city centre can be a great option. In Ireland, you’re not required to tip taxi driver, but a small amount is always appreciated. 💡 PRO TIP: In a rush? Tired after your flight? Ask your driver to take the Dublin Port Tunnel. This congestion-free shortcut can reduce the journey time between Dublin Airport and Dublin city centre by 10 minutes or more, depending on traffic elsewhere. Downside? You will be charged between extra on your fare. Where Can I Get A Taxi From Dublin Airport to Dublin City Centre? Taxis are available in the forecourts directly outside both Terminal 1 and Terminal 2. Depending on when you arrive, there may be a queue. But the wait shouldn’t take too long. Dublin taxis are not a uniform colour or car brand, like in New York, for example. You’ll recognise them from the yellow and blue light, mounted on the roof. You’ll know a taxi is available if this light is on. A taxi without the light on has passengers aboard, is booked to pick up elsewhere, and will not stop when you hail it. How to hail a moving Dublin taxi? Simply raise your arm and wave it as the taxi approaches. No need to whistle! 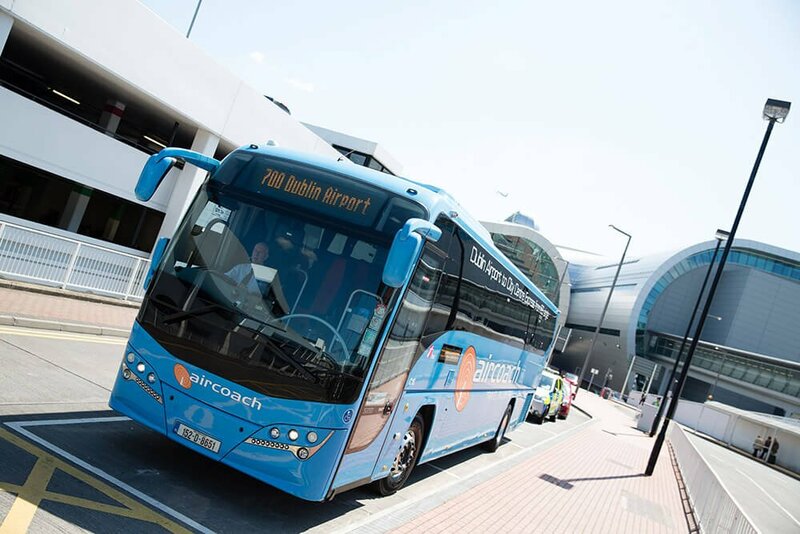 Aircoach is the only 24 hour coach service operating between Dublin Airport and Dublin city centre. The main Aircoach route (700) to the city centre departs every 15 minutes between 3.15am and 11.55pm. Outside of these times, it’s every 30 minutes. 💡 PRO TIP: If you’re staying at the Grand Canal Hotel, you need to take Aircoach route 702 (Greystones/Bray) or 703 (Killiney/Dalkey). Just disembark at the Schoolhouse Hotel stop (your driver will announce it). From there it’s only a 3 minute walk to the Grand Canal Hotel. If you’re travelling solo, the Aircoach may be more cost efficient than taking a taxi. The cost is €7 for a single ticket or €12 for a return. Where Do I Catch An Aircoach? Aircoach picks up at the front door of both Terminals 1 and 2. Terminal 1: When you exit T1, turn left immediately and you’ll see their stop. Terminal 2: On exiting the baggage reclaim area, continue along the same level. Make sure to follow the signs for buses and coaches. Cross the footbridge, and then exit the escalator on the left side. There will be an Aircoach customer service team there to answer any questions. 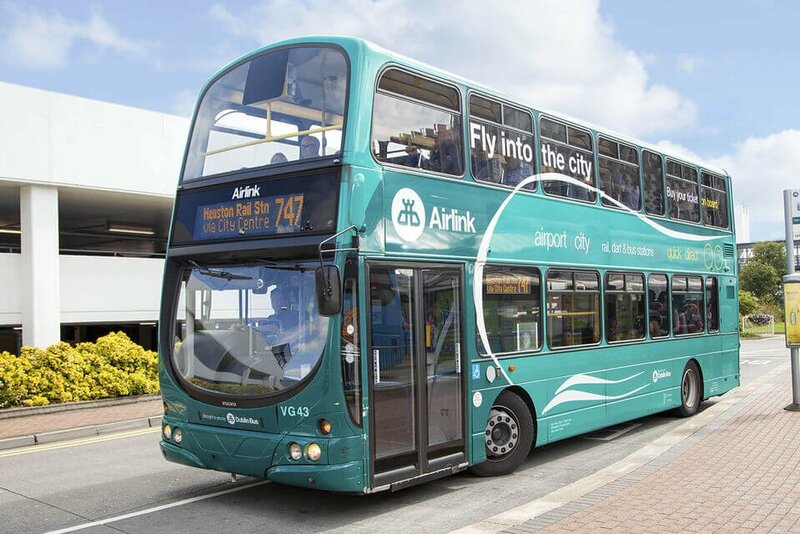 The Airlink is an express public coach service from Dublin Airport to multiple locations throughout Dublin city centre. It’s cheaper than Aircoach. However, in our, experience it’s not as comfortable as Aircoach and not as convenient as a taxi. Airlink accepts Leap Cards (see below). Without a Leap Card, it costs €6 one way or €11 return. Unlike other regular public Dublin bus services (see below), you don’t need exact change. Do be mindful that timetables are different on Sundays and public holidays. Airlink uses the Port Tunnel, which runs under much of the north side of the city. The service runs 7 days a week from 4.45am to 00.30am up to every 10 minutes. For those staying slightly more central in the city, the 747 will take you there. Where Do I Get The Airlink From? The Airlink goes from both Terminal 1 and Terminal 2. According to their website, Airlink will have staff there to meet and greet you. Terminal 1: There is an Airlink information desk in the arrivals hall. You can purchases your Airlink ticket there, at the Spar shop (a small store) or at the vending machines at the bus stop. Terminal 2: You can purchase your ticket in the Spar convenience shop, to the right immediately as you emerge into Arrivals area. Their staff will also assist you with any queries you might have. Want discounted travel on bus, tram and rail services in Dublin? Pick up a Leap card. These little green charge cards are small but mighty! They come in very handy if you’re spending a few days in Dublin, allowing you to hop on and off public transport. Need another reason? 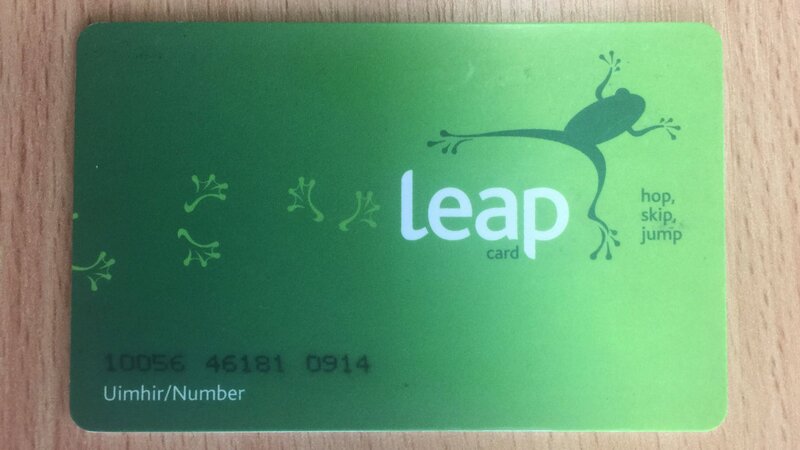 Well Leap cards also work on public transport in the Irish cities of Galway, Waterford, Limerick and Cork. Your best option is the visitor Leap card. It costs €10 for one day, €19.50 for three days and €40 for seven days – just select the option that best fits your timetable and budget. Where can I buy a visitor Leap Card in Dublin?